Rogue drivers, random rates and no regulation: Does Burlington's taxi system need an overhaul? Map of taxi fare zones in Burlington. For pricing, see sidebar. Have you been overcharged? Click here to share your story. Sarah Grillo has only lived in Burlington for two years, but she knows the local taxi business pretty well. Grillo, who waits tables at Nectar’s, often takes a cab home after the club closes to her apartment on North Avenue near Burlington College. She says the trip has cost her anywhere from $6 to $9.25. Sometimes she pays $7.60, which, according to the city’s zone system of cab fares, is the maximum charge allowed. But a few weeks back, a cabbie for Francis Transit tried to charge Grillo and two companions $25 for the fare. When she protested, the driver dropped the price to $20 and offered to forego a tip. The group ended up paying $15. Grillo also filed a complaint with the Burlington City Council, which caught the attention of Ward 6 representative Karen Paul. Paul recalled that, about four years ago, a driver overcharged her for a ride home from Burlington International Airport. Grillo’s complaint also reminded her of recent public testimony from Freddie Solomon, a longtime Burlington cabbie, who told councilors that the city’s taxi system is in need of serious attention. That was enough for Paul to draft a resolution, asking that the city begin reviewing how it regulates the local taxi industry. According to the resolution, which was passed on June 9, customers and cabbies alike complain that drivers often do not adhere to the city’s fare schedule. That makes it “difficult, and sometimes impossible” for customers to know if they are being overcharged. City officials recognize that the current fare structure is difficult to enforce. Drivers who violate the city taxicab ordinance can have their licenses suspended or revoked; they are also subject to fines from $50 to $500. Indeed, City Councilor Clarence Davis (P-Ward 3), who chairs the council’s License Committee, admitted he doesn’t know how complaints about taxis are logged. Lt. Kathleen Stubbing at the Burlington Police Department said that in almost two decades on the job, she couldn’t recall the department investigating a single complaint of price-gouging by cab drivers. While this state of affairs places consumers at a disadvantage, it has also riled cab company owners and drivers. Paul Robar, owner of the city’s largest cab company, Benways Transportation, blames the current chaos on the increase in operators, who are throwing the supply and demand of local taxi commerce out of whack. He says the city needs stricter regulations. It’s hard to say how many cabs are operating in Burlington at any given time. The city’s ordinance only allows for “a sufficient number of licenses to meet the public need,” which isn’t defined. Taxi drivers are required to be licensed, which costs $40 and must be renewed (for $5) every August. A felony conviction and findings of negligence in two or more motor-vehicle accidents in a five-year period are grounds for a denial of a license application. 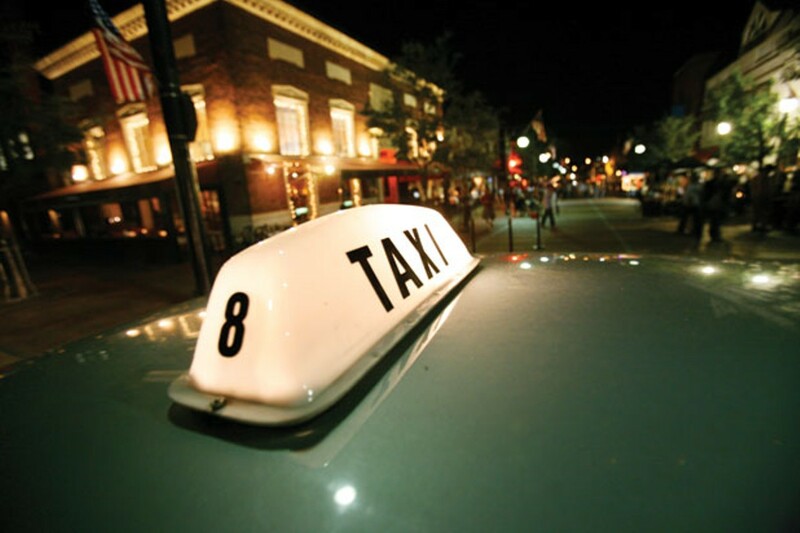 According to a registry maintained at the airport, 130 companies are licensed to operate taxis in Burlington, only slightly more than were licensed five years ago. The registry may not be accurate, however: All of the drivers interviewed for this story insist that the number of operators has risen in the last few years. Drivers also say that the increased competition for fares, coupled with rising gas prices, have forced local operators to raise their rates above the legal limits. That much was clear last week, when I took a half-dozen cab rides to various locations in Burlington. Cabbies who pick up in town charge passengers according to a series of maximum rates that apply to different areas, or zones, of the city. Zone 1, which stretches from Howard Street to North Street, includes the Church Street Marketplace. Zone 2 “south” covers the south end, while Zone 2 “north” includes the northern reaches of the Old North End and a segment of North Avenue that includes Burlington High School. Zones 3 and 4 cover the rest of the New North End and are bordered on the east by the Winooski River. City ordinance requires drivers to post a zone map and a current license in their cars. None of the drivers I rode with displayed the map, and while a few had what looked like a license strapped to their sun visors, it was difficult to tell from the back seat whether they were legitimate. All of the drivers I rode with charged fares that were between 40 cents and $4 over the legal limit. Bob Dennis, a mustachioed 51-year-old wearing a baseball cap, picked me up at City Hall and dropped me off at the corner of Howard and Pine, just beyond Speeder & Earl’s coffee shop. According to the zone system, the fare should have been $5.75. Dennis, the owner of 5 Corners Taxi in Essex, charged me $8. When I called him later to ask about the fare, Dennis said he tries to “stay as legal as I can.” But, with the cost of maintenance, insurance and fuel all going up — not to mention wage stagnation caused by some of his regular customers using other means of transportation — Dennis said he had little choice but to charge more than the city allows. Other drivers offer the same story. Larry Bushey, who has owned Burlington’s Yellow Cab franchise since 2000, said cabbies are “doing what we can to survive” these days. Drivers say they can make anywhere from $15,000 to $17,000 annually on the streets. That was a modest wage when fuel ran $300 to $400 a day. Now, Bushey says, he spends $1000 a day on gas. Dominic Ladue used to drive for Benways before starting his own business, Ladue’s Taxi. He says Burlington is “saturated with taxis to the point where it causes a lot of confusion.” In some cases, he says, drivers will “lowball” their rates, undermining competitors. At other times, they overcharge, which creates problems for everyone. Matt Kelsh, owner of MaJak Taxi, says he started “working the bars” for Benways back in 1993. Kelsh says that even drivers who operate at the airport are starting to raise their rates beyond what the city allows. Airport cabbies pay $500 per year for the right to queue up outside the terminal. They charge a base fare of $8.50, plus $2.50 for each of the next 8 miles. But Kelsh claims that some drivers charge an illegal $2 “fuel surcharge,” while others “run the meter” by taking circuitous routes. Still others, he says, tamper with their meters so they register artificially high fares. Kelsh notes that the city council could get a better handle on the situation by taking a few cab rides themselves. As it is, few people seem to notice they’re being overcharged, and if they do, they don’t know what to do about it. Kelsh adds that, in 15 years, he’s never known of a single driver whose license was suspended for violation of the city’s taxicab ordinance. François Nsibienakou, a Congo native who owns Francis Transit, says the glut of cabbies on the streets of Burlington is related to the lack of opportunities for people with limited job skills. Nsibienakou, 42, took a job as a cashier at a gas station after moving to Burlington from New York City eight years ago. But because he had polio as a child, being on his feet for extended periods was difficult. So he applied for a job with Yellow Cab. “When I worked for Yellow Cab, I had my own car,” Nsibienakou recalled. “I thought, ‘Why don’t I do this by myself?’” Today, Francis Transit employs nine drivers hailing from the United States, Jamaica and countries in Africa. Francis Transit was the subject of Sarah Grillo’s complaints to the Better Business Bureau and the City Council, so I wasn’t completely surprised when one of the company’s drivers charged me $10 for a fare that, according to the zone map, shouldn’t have cost more than $5.75. A few days later, I met Nsibienakou in the Burlington apartment that doubles as the dispatch for Francis Transit and showed him the receipt. He said he didn’t recognize the driver’s signature. He also noted that the receipt wasn’t written on official company stationery. Nsibienakou says some of his drivers have had trouble understanding the fare structure under the city’s zone system. To avoid future complaints, he’ll begin posting signs in his cabs, encouraging customers to report illegal behavior. Some drivers, such as Dominic Ladue, like the metering idea, but not all do. Robar, who has owned Benways Transportation since 1973, has resisted meters for almost as long. He says they eliminate the ability to pick up multiple passengers headed for different destinations. Plus, he argues, they would make longer rides more expensive than they are under the zone system. 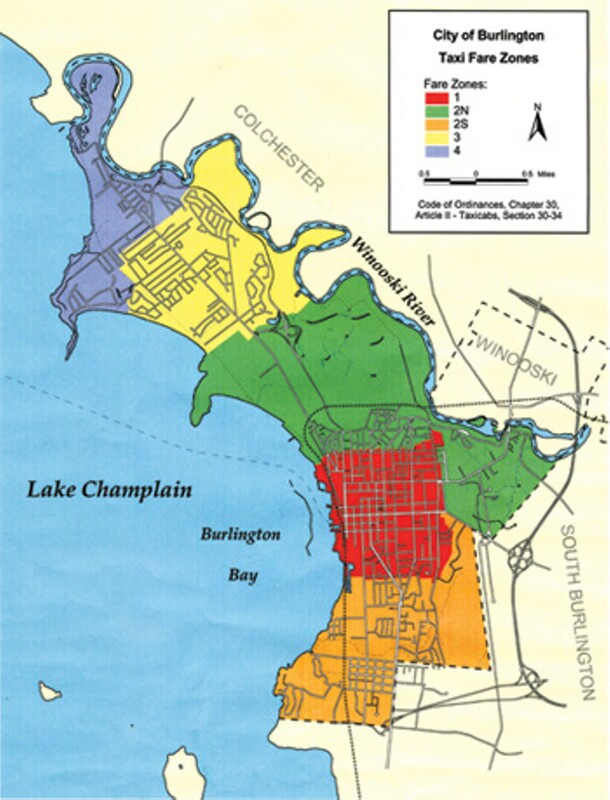 Robar would rather see Burlington adopt a medallion system, whereby the city would restrict the number of operators by issuing a limited number of licenses. Medallions are used to regulate taxicabs in many major U.S. cities, and the licenses tend to become quite valuable. In New York, a medallion was recently sold at auction for more than $1 million. In Boston, medallion owners can lease their licenses for as much as $500 per week. In any event, taxi operators agree that it has been much too long since the city raised the maximum fares allowed. According to the city ordinance, fares are subject to “automatic” annual increases equivalent to transportation rates compiled by the U.S. Bureau of Labor Statistics. The city council can also decide to impose fare increases if average gasoline prices increase by 25 percent. The council has apparently never exercised that prerogative, although Robar says he has repeatedly asked city officials to raise the zone rates. More recently, Ladue submitted a petition to the city last week, asking that the base meter charge for rides to and from the airport be increased from $8.50 to $10. Rep. Paul and other city officials say it’s too early to know what solutions will ultimately be considered. A committee of representatives from the airport, the city attorney’s office and the council’s license committee have just begun to meet. According to the council resolution, the committee will evaluate the current fare structure. Paul says the new regulations should also improve the complaint process and encourage stronger enforcement. Have you been overcharged by a Burlington cabbie? Click here to share your taxi story. We'll print some of them in next week's Seven Days. Have you been overcharged by a local cabbie? Click here to share your taxi story. We'll publish some of them in next week's Seven Days. Ever find yourself exiting a Church Street bar in the wee hours, but not ready to quit reveling? James Simpson hopes so. And he hopes that you have a few dollars left in your pocket. A former cabbie for Benways Transportation and Yellow Cab, Simpson is now the ebullient cofounder of Pedal Power Bike Taxi, Burlington's latest stab at fossil-fuel-free transport. This week, Simpson and his colleagues are releasing two "pedal cabs" into the city's taxi-jammed downtown. A bike-taxi experience, he assures, will be something of a "party thing." In addition to pleasure-seeking passengers, Simpson says, his drivers will haul pizza, parcels and whatever else will fit. 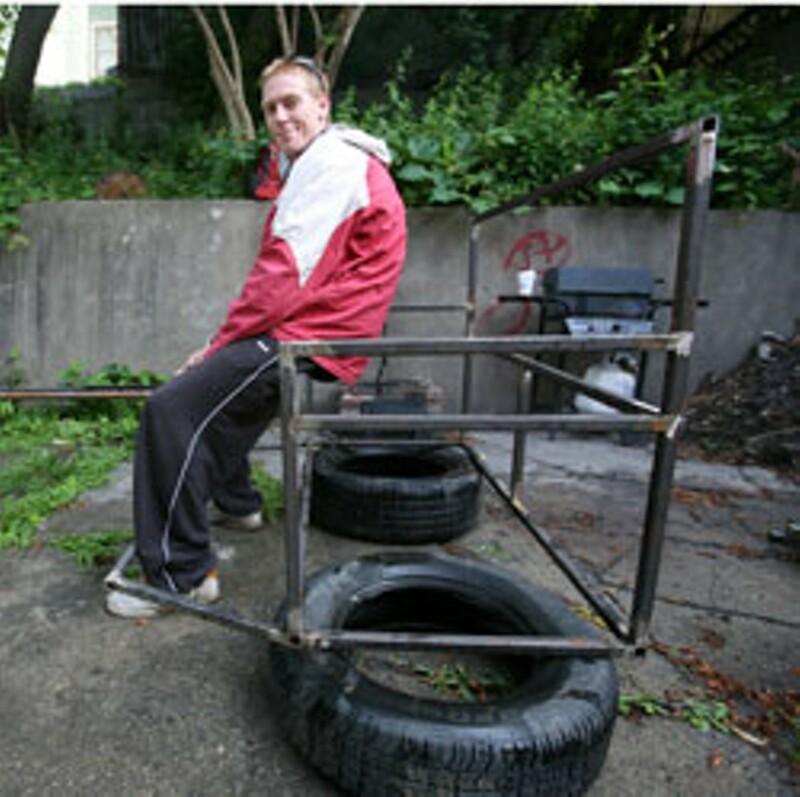 (Some Pedal Power rigs will haul up to 1000 pounds.) Says the 31-year-old Simpson, "I'm even trying to work out a delivery for kegs." And that's only the first leg of what could be a long entrepreneurial ride. Pedal Power's two-taxi fleet will soon expand to six, and Simpson's crew is manufacturing more gear at a "secret location" - a.k.a., his buddy's place in Winooski. Future projects may include "trikes" with electric-assist motors, "authentic Asian rickshaws" and a $6000 "bike car" with a fiberglass body. Simpson, who pedal-pushed passengers in Tucson before moving to Burlington, says he plans to sell the contraptions to clients in such neighboring towns as Plattsburgh and St. Albans. Hoping for a lift in his pedal-powered sails, Simpson recently applied for grant money from Burlington's Community and Economic Development Office. No dice. "They said they'd given out all the money, and they were waiting for it to be paid back," he reports. Ed Antczak, an economic development specialist for CEDO, says people have come to his office in recent years with ideas for everything from pedal cabs to rickshaws. "None of them ever materialized," he says. Simpson is unfazed. In fact, he is hoping to "make a killing" at the waterfront over the Fourth of July weekend. Later this summer - once Pedal Power has acquired "a good amount of bank" - Simpson hopes to move his makeshift office out of the Pearl Street skateboard shop Ridin' High Skate Shop. Since Ridin' High owner John Van Hazinga is a business partner, there's no immediate pressure to find permanent digs. Still, Simpson says, "We're hoping to get out of his hair."